Compsees 5th generation keyboard wedge. For all around price and performance the versatility of the TurboWedge provides the user with a multitude of features and functions. Using state-of-the-art powerful and flexible Flash EPROM technology has allowed Compsee to develop a small footprint wedge that combines all the features of previous Compsee wedges with numerous new user-friendly program parameters. The TurboWedge excels when it comes to input and output options. Input devices supported include bar code reader, Magnetic Stripe Readers and RS 232 input devices such as scales and portable terminals. Data passing through the TurboWedge can be decoded, edited and transmitted either as keyboard input or RS 232 ASCII. Wedge interface connections supported include all types of PCs and clones, as well a variety of other terminals from CLI, Decision Data, DEC, I-O, IBM, Idea, HP, Memorex, Wyse, etc. Bar Code Wands, Lasers, CCD's, Bar Code Slots, etc. 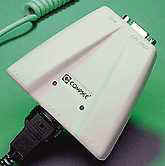 Serial RS 232 - Portable Terminals, Scales, etc. Installation of the wedge is simple and fast, simply plug between the keyboard and the terminal. For customization, the user can choose from seven different methods to program the TurboWedge set up parameters. Added to the traditional menu and cloning methods is serial or bar code batch, symbology validation, on-screen or Compsees Windows based PC program WinCape. As with all Compsee wedges, the TurboWedge contains the powerful editing features that allow the user to qualify the data input, inhibit invalid data from passing through and then format the output of the data to match the applications input screen . Easy to install, operates in any environment.